What is an Artist's Visual Library? Entertainment designers and concept artists are tasked with creating something from nothing. The best artists create things nobody has ever seen before while still feeling believable. The artist’s visual library is a crucial part of this creative process. Many artists only draw from life and this can leave them chained to references. How do you draw a dragon creature if you can’t look at a real dragon? There’s always the Internet, but what if you don’t have that? Now you’re relying on memory. This is where your visual library resides. Feng Zhu put together a detailed video explaining this visual library. It’s not as complex as you think but it’s probably more important than you’d assume. If you were the owner of a library you’d have access to thousands of different books at your fingertips day or night. You don’t need to read them all at every moment, but when you’re thinking about one particular subject you know where to find specific books on the topic. This is a great analogy of visual libraries for artists. In this case your brain is the library and all the metaphorical library books are the visuals in your head. The biggest question is where do you get all these different visuals for your library? Most artists subconsciously pick up visuals from things that stand out to them over the years. These could be anything from comic books to TV shows and print books(the imagination is a powerful thing). Some may conclude that drawing from a visual library is just copying other designs. In some ways this is true. But you’re really borrowing ideas from many different designs to create your own. There’s nothing new under the sun and while your designs may be unique by themselves, they’re most likely based on ideas from other visuals whether real or imagined. If you can accumulate a growing interest in life then you’ll quickly amass a bountiful visual library. Nobody has a perfect library and nobody has the same library. This is what can make your vision truly unique amongst a sea of other concept artists. So let’s say you want to start building your own visual library. This should be something in your head, but reference is always important because humans rarely make something without inspiration from life. The first step is to create a visual library folder on your computer. Create as many internal folders as you want: safari animals, house exteriors, bookshelves, breast pumps… whatever the hell you wanna draw. Spend time doing weekly studies with these different visuals. If you want to create airborne vehicles then make a folder of photos & art featuring aircrafts that appeal to you. Collect resources with aesthetics and designs that align with your goals. If you do focused studies you’ll grow quickly and learn a lot about the object you’re studying. This will inevitably lead to your internalization of the visuals with different elements and concepts to try in the future. If you draw nothing but airplanes for a month I guarantee you’ll be much better at conceptualizing and creating airplanes. But not everyone has access to an airport or hangar. This is where photo reference and other creative artwork becomes invaluable. My favorite sites to browse are Tumblr and Pinterest because they’re both visually-oriented social networks with thousands of new posts every day. We also have a rich inspiration category on this blog if you’re looking for digital artwork. Photo reference is also great if you can get it. Try your own photo shoots if you’re comfortable taking pictures by yourself. Every modern iPhone should have a good enough camera to provide reliable reference photos. But always be on the lookout to build your visual library on the Internet too. Whenever you find inspiration be sure to save copies and organize them well. 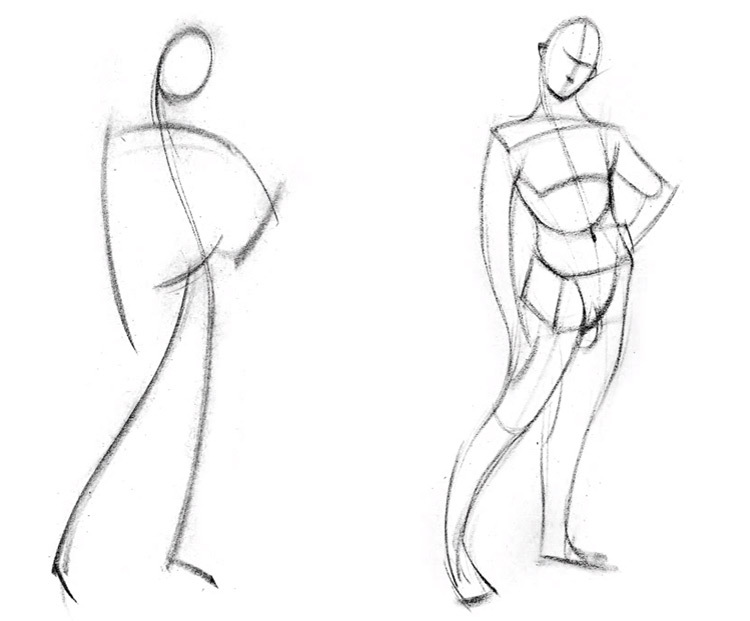 If you’re not familiar with gesture drawing then check out the free gesture video on Stan Prokopenko’s YouTube. Stan explains gesture in a simple manner starting with rough emotional lines and moving into greater detail. The goal of gesture is to see objects, poses, and forms with curves and movement. Capturing a pose in the fewest possible lines forces you to simplify everything. Eventually you’ll see things differently and build a vocabulary of line styles. Think about how much effort it takes an unskilled artist to draw a deep curve. A trained artist can do this quickly and effortlessly because they have the experience. By practicing gesture you’re forcing your mind to remember different movements and patterns in drawing. You can refer back to these different line styles when drawing anything from animals to landscape environments. Gesture is incredibly important and should be a big part of your practice regimen. You may not feel very skilled even after months of practice, but the more you do it the more comfortable you’ll get. With thousands of gesture drawings under your belt you’ll slowly learn to construct poses from imagination. This is very powerful and contributes a lot to your visual library. As you practice you’ll improve your cognitive abilities to think quickly on the spot. You’ll be able to draw new ideas that pop into your mind without much hesitation. This is where a large visual library comes into practical use. If you draw from life frequently you’ll notice little things that catch your attention. The devil’s in the details and observation is key. Be willing to try drawing new people/animals/objects, even subjects that you don’t like. If you can draw something over and over you’ll learn to see its natural curves in your head. You’ll better understand its proportions, values, and forms. Doing these types of studies covering enough objects over time will leak into your daily work. To get started I recommend scanning other pieces of art for ideas. 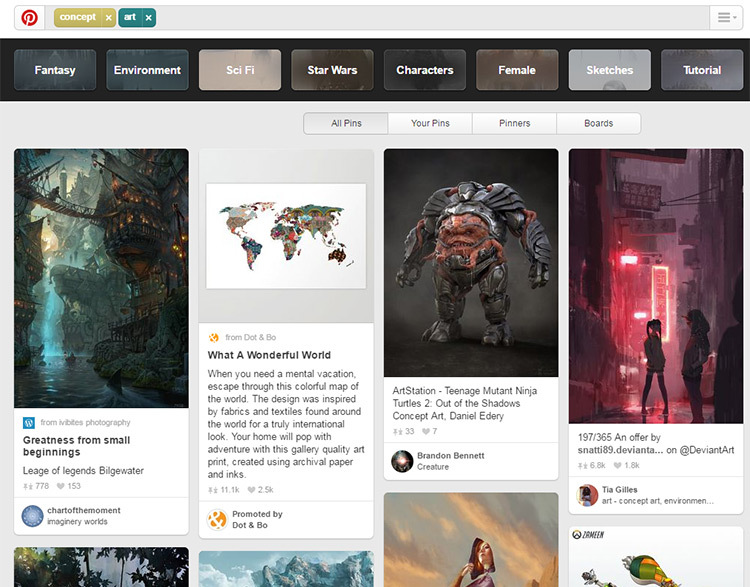 ArtStation is an incredible site full of talented professionals and students alike. You can learn a lot by studying what other people do in their art. Be willing to examine everything you can get your hands on. Photos, paintings, sketches, and real objects. Do lots of different studies and try your best to commit everything that’s visually appealing to save in your memory. As you build up your digital library of references you’ll find it’s much easier to perform studies and to retain visuals in your head. There is no absolute right or wrong way to approach building a visual library. Just draw whatever captures your attention. Over time you’ll be surprised how many visual concepts can be retained in your brain.